Tomorrow is 20 YEARS since the broadcast of the very first episode of #Futurama! We're starting a hash tag, #Futurama20, to celebrate. Tell us know favourite moments, lines, characters, episodes or anything else about what the shows meant to you! Here's to another lousy 20 years! Disenchantment... Will you be enchanted? 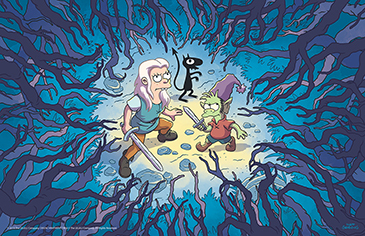 So I meant to get this review up at the beginning of the week but life happened so I'm posting the night before the release of Matt Groening's new show, Disenchantment, worldwide on Netflix. It’s been almost 20 years since the launch of Matt Groening’s last show, Futurama but on Friday 17th August Netflix will launch all 10 episodes of his newest show, Disenchantment. I was lucky enough to get access to the first 5 episodes(actually it was 7 but I didn’t want to binge all 7 for the purposes of a review). This is a relatively spoiler free review of those first 5 episodes from the perspective of a Futurama diehard. But also from someone who is realistic about what’s bad and what’s good. I’ll be the first to admit Futurama had some dud episodes but there were handful of episodes that were some of the best television of the last 10 years. Disenchantment has a high bar to clear. So I came into this show with quite high expectations. Matt Groening, animation by Rough Draft who produced Futurama, music by Mark Mothersbaugh, some of the best Futurama writers including Futurama co-creator David X Cohen, Futurama voice cast… This all sounded great and to sum up my feelings on the show, I loved it. But with some caveats. Some bigger than others. The basic concept for the show is thus; it’s about a Princess, Bean, who doesn’t really want to be a Princess and would rather gamble, drink and hook up with guys and go off and have her own adventures. So she hates the fact she is being forced into a marriage created mainly for political reasons. For reasons that don’t really matter just yet, a personal demon, Luci, assigns himself to her and makes it his job to persuade her to misbehave and generally cause trouble. She’s also joined by Elfo, an elf who escapes his kingdom fearing he’s missing out on the world. Together under the watchful and frustrated eye of her father King Zog we follow their adventures around the kingdom of ‘Dreamland’. There is quite a lot going on with this show so I’m going to break it down into some elements to make it easier. The first area is animation which is easy to sum up - fantastic! Rough Draft have really out done themselves on this. While the character work is relatively the same quality as on Futurama there is some interesting work going on with Luci who is jet black with eyes and no other defining look. This makes for some interesting movements and some good comedic moments like when Bean kicks him against the wall and he slowly rolls down it like a sticky toy. Elfo also seems slightly devolved in his look like he’s jumped straight out of the pages of Groening’s comic strip Life in Hell. And I like that about him! But where the visuals really stand out is some of the amazing painted backgrounds and sets. Rather than being drawn like Futurama or the Simpsons these have far more detail and look gorgeous. It also adds to the whole fantasy world setting much more. The 3D work is also really seamless. While on Futurama it stood out more that was ok because it was a sci fi show, this isn’t so it needs to blend in with the new painted backgrounds which for the most part it does very well. It will be interesting to see what flourishes they come up with as the show gets going and gets more adventurous with plots and locations. Then on top of all that is some really nice opening credits which show scenes from the episode underneath the credits made out of simplified outlines in different tones of greens or blues etc. Its really nice. Next up are the actors, which again is hard to find fault with. All the Futurama cast bar Katey Sagal are here which is an embarrassment of riches in itself. These are people on the top of their game and it’s hard not to be in awe. They’re also joined by Abbi Jacobson as Bean, Eric André as Luci and Nat Faxon as Elfo. They’re well cast too. Jacobson brings a rebellious but often insecure quality to Bean which makes her likeable from the start while Eric André is obviously having fun being a very smooth kind of evil and his droll delivery of put downs are fun to hear roll off his tongue. My favourite of the three is Nat Faxon though. Is zany delivery always gets a laugh but he can also dial it back to bring some real heart to the confused, slightly stupid little elf. Other actors such as Matt Berry, Lucy Montgomery and Noel Fielding are fun too and while it’s shame there’s not more Billy West it’s great to see Maurice LaMarche and Tress MacNeille with leading roles. The real stand out though, is John DiMaggio as King Zog. It’s hard not to wonder how he has a voice anymore after you hear him rant and rave at Bean. You can almost hear the veins on his neck pulsing. But the great thing about his performance is not all the yelling but how he manages to convey a character with real depth. While he’s a very angry and demanding King it’s obvious he’s quite insecure and is sometimes torn between making Bean do what he thinks is right and gradually realising he can’t really control her and that ‘tradition’ makes her miserable. It’s really great to hear and scenes with him often really crackle. I particularly like the way he looks at things, vocalising his inner thoughts as he casts his eye over the different parts. Mark Mothersbaugh from the band Devo who also created the fantastic score for Thor: Ragnarok last year has provided the music, including a very catchy theme tune. The music has a grand fantasy feel to it that’s been mixed in with some nutty rhythms and eccentric brass instruments and many more elements. It’s really great and adds so much to some scenes that sometimes might be lacking a bit of zip. More on that later. So plenty of great ingredients there so what are the actual stories like? In short, very good but certainly with room to grow as the characters and writers fall into a rhythm. One thing that can be said is that the plotting is pretty much solid all the way through. These are folk who really know how to break a story and create good arcs both within episodes and longer ones for characters. Groening has said that for this they wrote the stories and then added jokes and you can tell as the rhythm of each episode moves well with not many instances of skipping over plot points or lingering too long within scenes that don’t require it. Sometimes the pacing could be a bit quicker but it doesn’t often feel like we’re in a scene for no reason. The first two episodes act more as a two part pilot and were the strongest of the 5 I saw. While it starts off a little slowly as we’re introduced to the world and our main protagonist it quickly picks up and by the time we meet Elfo a few minutes in the plot is moving along well and the jokes are flowing. The scene in Elfo’s home land is very funny and reminded me a little of Santas elves in Futurama though doing a lot better for themselves. It also has one of the darkest jokes so far where one of the characters gets hung but then is too light so someone suggests just stabbing them. It’s very funny for sure(trust me) but it shows a real bite which does seem to appear more regularly than on Futurama or The Simpsons. Matt Groening has said this show is more adult and I think this is what he means rather than putting in strong language, really crude humour all the time(though there is some of course!) or really edgy plots that aim to offend. It almost seems like some of the darker humour from Life in Hell(still some of Groening’s finest, unfiltered work) is making it’s way onto the show and I for one welcome that. But back to the first two episodes. It has to be said what an achievement it is for these two. Nostalgia always plays a part affecting our memories but if you’re really honest the first episodes of most shows including Futurama and The Simpsons were not huge successes. They were good for sure but it’s hard to set up a new world and new characters in just half an hour. If you look at Futurama, it does a solid job of setting up the show but there was lots that it grew into. Fry was a slightly stupid but earnest character. Leela was very bossy and Bender was mainly a sarcastic, selfish robot. Think about how much that show blossomed and added so many more layers in just following few episodes. Don’t get me wrong I really love that episode but the really great stuff comes later. On Disenchantment they seem very sure of their world early on. A lot of the characters have direction early on and you understand a lot of what they’re about. The parts with Elfo were the most enjoyable as he journey’s through Dreamland encountering lots of weird things and creatures including a very funny ‘war’. By the end of the episode we’re all set with a 3 piece gang ready for adventures. The next three episodes are good but maybe suffer a little from growing pains. There’s some really great stuff with Elfo & Luci plus we get to know more of Bean’s insecurities but I couldn’t help wanting them to go and find some weird creatures in the land and in episode 4 when Bean throws a ‘Castle Party’ after Zog goes away it kind of feels like we’ve seen this sort of story many times before. Luckily there is some good character work and you start to really see Bean’s loneliness and how she lives. It seems so far that the show really hits a rhythm with story and especially jokes when we’re away from the castle in particular like when at the end of episode 5 we meet a very twisted version of Hansel and Gretel. But the writers are certainly having fun creating this world, from versions of modern things such as police chases to ‘Land Vikings’ there are some really enjoyable twists on the fantasy and medieval tropes. The joke rate in these episodes is maybe not as consistent as you might expect but it’s not that the jokes aren’t landing it’s just there are less. The focus is more on story and character. I’m putting this down to the show finding it’s way and I’m sure by the end of this season we’ll be moving along at more of a click. And it’s certainly better to pick your jokes when they’re funny rather than throwing so many at the wall to see what sticks. Ahem, Family Guy. The humour of the show seems much more akin to Futurama. While The Simpsons got most of it’s jokes out of satire or very relatable family situations, Futurama was about people who weren’t sure where they were going but were trying to have fun anyway and the jokes came from that. It was a much more loose show that felt it could go anywhere and I’m sure it will. That’s really what it comes down to. The show is growing into itself and has all the ingredients for something amazing. For now it’s just great with a lot of potential and already some really noteworthy moments under it’s belt. I’m really enjoying it so far, things are looking good for this show and I can’t wait to dive into more episodes. Though I won’t be binging and I wouldn’t recommend it. You’re going to want to savour this. It’s not often a Matt Groening show comes along and when you’ve watched it it’s another year until season 2! It’s your choice but there’s something to be said with enjoying an episode and letting it sink in rather than sitting for 5 hours and being done with it! No, we fire them all the time! Oh you want new Futurama do you meatbags? Well here! Have some! For the first time since the show was cancelled(again!) 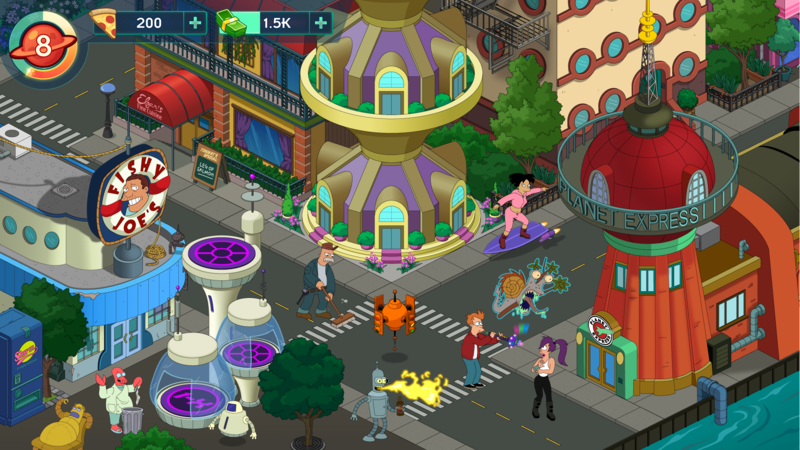 in 2013, Futurama is back with a new story! Before you start firing up your hologram projectors to watch it, this episode is in audio form! So you can listen to it while you’re working in your dead end job, sat on the toilet, even while making love! The new episode, excellently dubbed Radiorama, has the ENTIRE cast back reprising their beloved roles in a new 40 minute story written by 3 of Futurama’s original writers; Ken Keeler, Patric Verrone and series co-creator David X Cohen. So where can you hear this new story I hear you yell, please keep it down I’m only here, it’s actually really rude to yell and it hurts my eardrums? Well you can watch it on YouTube at the below embedded video or you can download it for listening later through the Nerdist Podcast. Developer Jam City has really gone to town on this it seems, working with creators Matt Groening & David X Cohen along with other writers from the show, the original voice cast and Futurama’s animation studio Rough Draft. The game ‘blends simulation, combat, galactic exploration, and choose-your-own-adventure gameplay’. Does this add up to a great game? Seems like it will but do let us know in the comments, on Twitter and Facebook what you think of it. I’ll have a review in a week or so when I’ve had time with it. The game is free to download with in app purchases for some of the more premium stuff. And here's some animated trailers for you to enjoy! Last week, there was a table read featuring the entire cast(minus Katey Sagal) & David X Cohen. If you missed it you can watch it on the Futurama Facebook page. TODAY there will be reddit AMA with Matt Groening(his first ever AMA! ), David X Cohen, Billy West, John DiMaggio and Chris DeWolfe(co-founder and CEO of Jam City). It runs from 11:30AM - 1PM PDT and you can submit questions from 11:00AM here. Also today is a live streamed Q&A featuring everyone above PLUS Maurice LaMarche, Phil LaMarr and Lauren Tom. You can see this on the official Futurama Facebook page. from 2:30-3:30PM PDT. Until next time meatbags, happy gaming! This game is the Schmiz! Greetings again Ladies and Gentlemen and Smizmars! 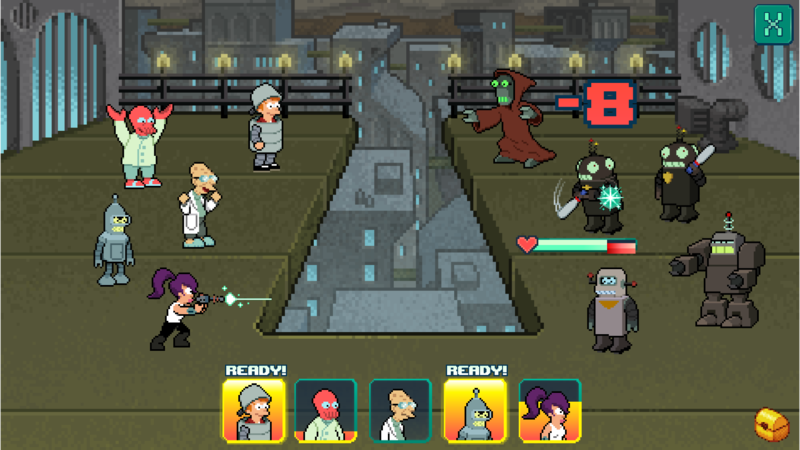 Finally some news on the Futurama front! 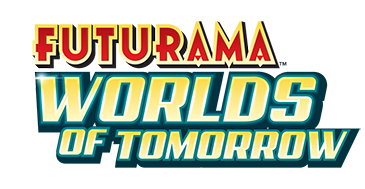 Game Developer Jam City has released the first details and screenshots of the upcoming game Futurama: Worlds of Tomorrow. As well a being a world building RPG game in vein that we’ve seen before in The Simpsons: Tapped Out and Jam City’s own Family Guy: The Quest for Stuff, they will also be incorporating arcade style gameplay with retro 16 bit visuals and decision based exploration. It certainly seems like an ambitious undertaking so we’ll await the release with keen interest! In the meantime Futurama animation studio Rough Draft(who Jam City have been collaborating with on the game) have produced a trailer for the game, the first bit of Futurama footage since 2013. In the words of Matt Groening: “If you squint, it’s kind of like a little episode!”. 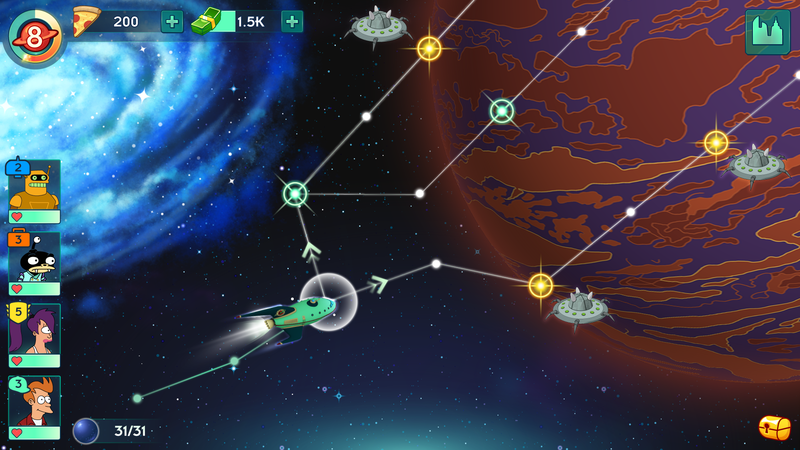 After enjoying that nugget take a look at these 5 screenshots and read some more about the game in the press release. The game will be released on iOS and Android with special editions inserted directly into your eyeball. Just checking in with a quick update on some fun things that have happened recently in the world of Futurama. As always, follow us on twitter for much more frequent updates and smaller tidbits and links to articles. Also, for those that haven't seen, man of a thousand voices like Fry, Farnsworth and Zoidberg, Billy West has been reading many quotes from that grunka-lunka wearing a blonde wig, Donald Trump... in the voice of Zapp. It's hilarious and oddly well fitting so have a browse through Billy's twitter timeline to check them out along with some cameos from Maurice LaMarche as Kif. They're also handily compiled on YouTube. After a gap almost as long as Fry's cryogenic slumber we're back! Sorry for the lack of updates on here(though I'm sure you were keeping up with all the latest new on our twitter page!) but we've had some issues with our news feed that stopped us from updating. So what's new? Really? You did that? Isn't that illegal? No? Well that's good I suppose. Me? I'm good. Thanks for asking, that's so kind of you. 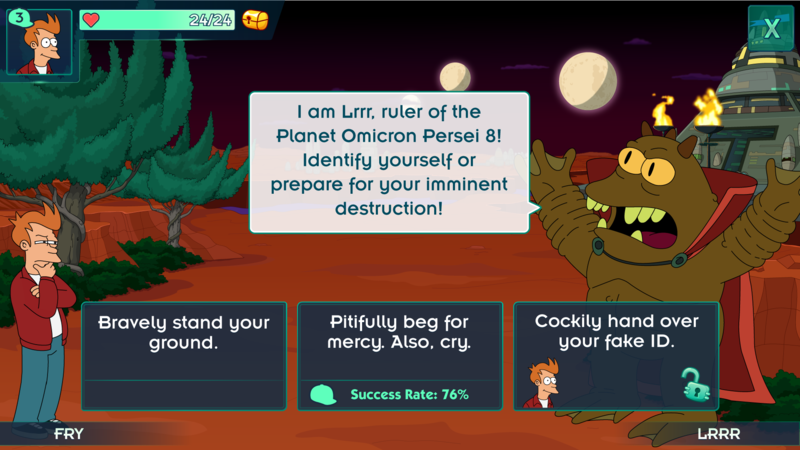 Oh so what's new in the world of Futurama?! 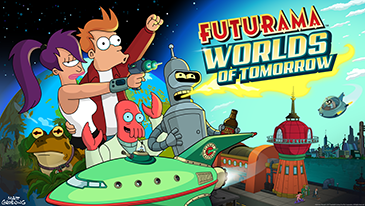 Well this update is out just in time(some would say it was deliberate) for the release of the new Futurama game for iOS and Android! 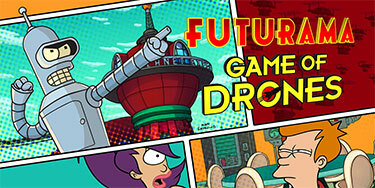 Futurama: Game of Drones is out TODAY! and is free to download. Featuring a new story from series writer Patric Verrone, the new game from Wooga is puzzle style game and then some! Check out the Wooga youtube page for more including a great behind the scenes featurette. Download NOW from the iOS App Store and Google Play! Let us know on our social media sites what you think of the game! Ho ho ho! Buy Kaplan's book! Christmas is fast approaching and you're no doubt wondering what to get your robosexual partner. Well look no further than the new book from friend of the site Eric Kaplan, writer of Jurassic Bark, Parasites Lost and other great Futurama episodes. 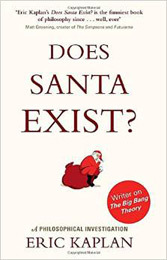 Eric is now co-executive producer on The Big Bang Theory and was prompted to write a book on the philosophy of Santa after a conversation with a parent of one of his son's friends. The book, which Matt Groening calls 'the funniest book of philosophy since . . . well, ever.' is available in ebook and primitive paper format and definitely worth your time! There is also a brilliant 'choose your own story' trailer(s) by Eric which you should check out. » [26-05] Now get a signed photo! » [15-05] Bite my shiny metal senate! 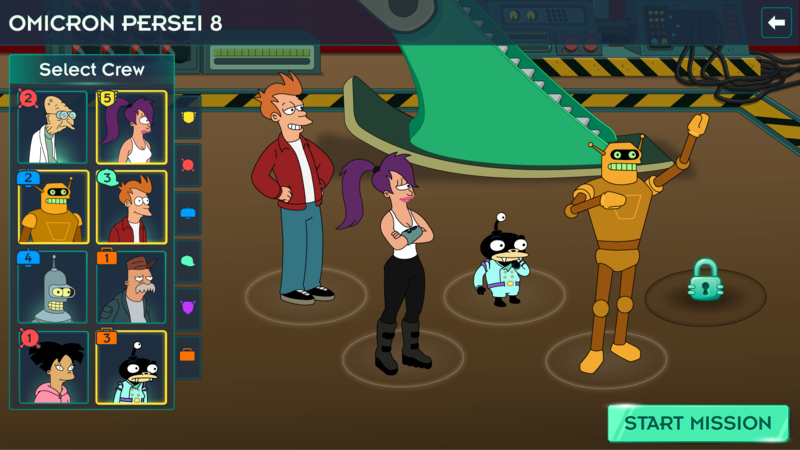 » [12-03] Futurama! Math! Win tickets! » [27-10] Bite My Shiny Metal Documentary! » [30-08] Own something really unique! » [01-07] Ask David Anything!